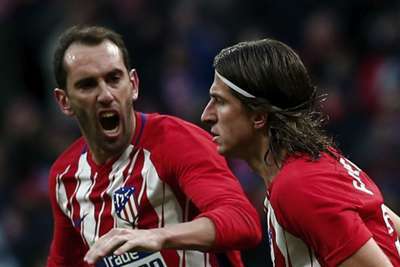 Atletico Madrid received a boost in the aftermath of their 3-0 victory over Deportivo Alaves as defenders Diego Godin and Filipe Luis returned to first-team training. Neither player featured in Saturday's win at the Wanda Metropolitano, where Nikola Kalinic, Antoine Griezmann and Rodri scored the goals that ensured Atleti kept pace with second-placed Sevilla in LaLiga, with both sides on 28 points. Filipe Luis has missed Atletico's last three matches due to a calf strain, while Godin has been on the sidelines for a month with a thigh injury. The experienced pair are expected to be available for the club's Champions League Group A clash with Club Brugge, in which a win will secure first place in the final standings. Head coach Diego Simeone may draft Godin straight back into the side after Lucas Hernandez damaged the medial collateral ligament in his right knee against Alaves, forcing him out of the game in the 35th minute. Filipe Luis, meanwhile, must displace Saul Niguez if he is to reclaim his spot at left-back.